RUPP, S. / T. DOERING, EDS. AMSTERDAM: RODOPI, 2005. Encuadernacion original. NUEVO / NEW. RUPP, S. / T. DOERING, EDS. 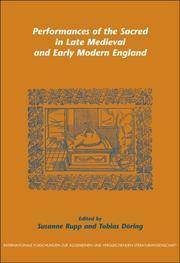 PERFORMANCES OF THE SACRED IN LATE MEDIEVAL AND EARLY MODERN ENGLAND. AMSTERDAM, 2005, 206 p. Encuadernacion original. Nuevo. 2005-03-01. Good. Ships with Tracking Number! INTERNATIONAL WORLDWIDE Shipping available. May not contain Access Codes or Supplements. May be ex-library. Shipping & Handling by region. Buy with confidence, excellent customer service!